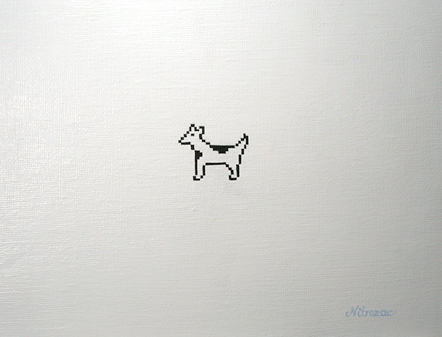 Nitrozac paintings: Dogcow 7"x9" acrylic painting (five available!) Three sold! Dogcow 7"x9" acrylic painting (five available!) Three sold! NEW! You can now purchase a Dogcow painting directly via the webstore! Here is the link! This time I've painted the adorable and much loved Clarus the Dogcow. If you don't know about Clarus, then take a look here, here, or here for some background on her! 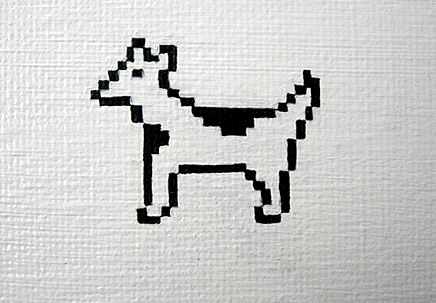 The Dogcow was originally created in 1983 by Susan Kare as part of her Cairo font. Over the next few years this little image became a cult sensation with a vast and loyal following. By the way, if you haven't checked out Susan Kare's website, please do... she has some great t-shirts there! This auction is a little different as I am offering five 7x9 inch paintings of the same subject. This is partly due to popular requests (people are so disappointed when they don't win a painting) and also because Clarus is just so darn fun to paint! How it works is like this: the five highest bidders will each win a painting. The top bidder will recieve one, then I will use the "second chance offer" feature of ebay to sell the second one to the second highest bidder. Then I will use the second chance offer again to sell the third painting to the third highest bidder, and so on. This will give five people a chance to own a moof'in piece of art! I am pleased as punch as to how the paintings turned out... they are simply adorable. It's such a joy to see the little dogcow, and it makes me smile every time I look at her and I know it will you too. The photos are from one of the paintings. The paintings are identical as the five dogcattle are the same size and in the same position in each painting. In essence, the paintings are quints! They make quite an impressive herd. Sadly, for some insanely crazy anti-dogcow reason, Clarus was put out to pasture when they built Mac OS X. Page setup dialog boxes will never be quite the same without her. But rejoice, as you can now own an original work of art featuring her, and you can view her at any time, even when your computer is sleeping. Good luck and good bidding! Remember in this auction, bidding early means you might actually pay less for your dogcow!